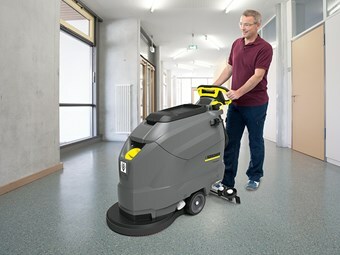 The new Kärcher BD 50/50 Classic walk-behind scrubber drier is a compact and easy-to-operate floor cleaner designed for use in shops, in medical and nursing facilities and all kinds of communal cleaning. As the BD 50/50 Classic is only 1m in height and 500cm wide, it allows the operator to have a clear view of the working area and can easily be stores after use. The 57kg machine, announced in Germany recently, has a clean water tank capacity of 50 litres, which Kärcher says will allow for up to an hour's uninterrupted cleaning. "It is simplicity of operation and maintenance that makes the new Classic scrubber drier stand out," the company says. "Scrubbing, vacuuming or polishing can all be activated by a single dial. "The BD 50/50's disc brush can be changed easily and safely, thanks to a pedal which locks and releases the brush head. "The battery too can be accessed easily, since the dirty water tank which lies above it can simply be lifted out of the machine," Kärcher adds. "This means that the battery can be changed in a few steps, which reduces the time out of service for recharging to almost nothing. It also makes the machine perfect for shift operation." Additional equipment such as brushes, scrapers or mops can be stored and carried with the ‘Homebase’, which is available as a panel or as a container. The BD 50/50 Classic has a brush working width of 510mm and a maximum theoretical area performance of 2,000 square metres per hour. Australian availability has yet to be confirmed. 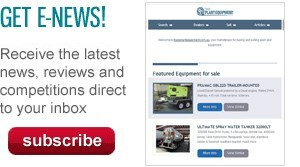 Click here to find cleaning machinery for sale.